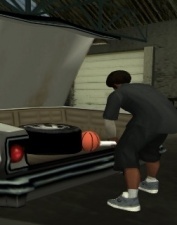 Opening car trunks was an anticipated feature in GTA: San Andreas, but turned out to just occur during a cut scene. Another preview to have offered gamers a good introduction into GTA IV was the Official Xbox Magazine in the United States. As you'd expect, no new information, except for one thing that accidentally slipped through to the magazine while getting a demo of the game. When they approached the parked car in Broker from behind, the Admiral that so many publications got to see getting broken into, an information prompt came up on the top left side of the screen, indicating to press the left bumper or "LB" button of the Xbox 360 controller in order to open the trunk. This button is the equivalent of the PlayStation controller's "L1" button. How far this will stretch into game play can only be speculated, but it can and probably will open new opportunities when playing GTA IV, both during missions and non-missions. Perhaps even throw dead (or not so dead) bodies in? Rockstar Games didn't want to discuss anything about this feature. The last of the first round of magazine previews are coming to an end, and the next issues to come out next month will probably provide new information on the game.... we hope.